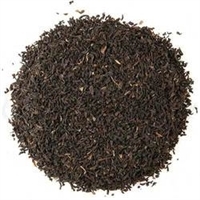 The tradition pressing black teas into various forms and shapes dates back to the early Song Dynasty, 960 – 1279 BC. Sculptors and artisans would work with tea the way others worked with clay or textiles to form and mold delicate works of art. Unlike traditional art pieces however, these tea creations were never meant to be permanent, instead serving to represent the impermanence of life, love and happiness here on earth. 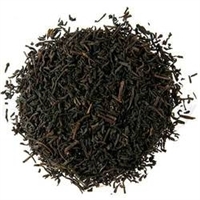 In the modern era, the traditions continue and the stores and fables of life and love still serve as the inspiration for the creation of unique tea pieces. One such story, although it originally came from the Western tradition, inspired the manufacture of these tea hearts: the tragic tale of Anthony and Cleopatra. The story of Mark Anthony and his star-crossed lover Cleopatra is one of the most famous love stories of all time. Mark Anthony, living in Alexandria Egypt, falls in love and moves in with Cleopatra. It would have all been very straightforward if not for the fact that he was already married to another woman back in Rome. Over the years, Anthony and Cleopatra are separated by trial, war, and bloodshed, but are ultimately reunited in death. Anthony, unable to bear defeat in battle against Caesar, kills himself by falling on his sword. Hearing the news by messenger, Cleopatra follows suit and poisons herself with the venom of an asp. 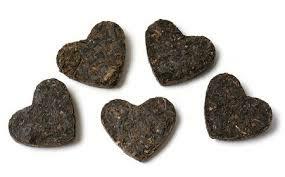 These beautifully pressed Yunnan tea hearts serve as a testament to fractured love. Like love itself, the hearts are fragile and breakable, and when the trials and tribulations of life come to bear on it, can unravel. 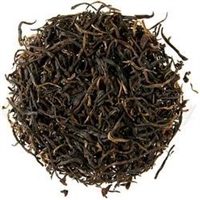 In the same way, boiling water poured over the tea hearts caused them to undo, infusing with rich, bold liquor. The produced is tremendous – dark, with deep notes of wine and subtle earth full body and medium-long finish.